Toastmasters Speeches: The Play-Sample Speech, "The Little Prince"
Is everybody familiar with the book The Little Prince? We did a book review on the book The Little Prince not too long ago. And that was when I was in high school – not too long ago. According to Wikipedia, the book has sold more than 80 million copies worldwide and has been translated in more than 180 languages and dialects. It was written by a pilot who’s also a writer by the name of Antoine du Saint-Exupery. It's one of the best-selling books of all time. It has been adapted into a musical, into operas and plays. It has even been adapted into an animation series. Although oftenly touted as a children’s book, The Little Prince makes many profound and idealistic points about life and human nature. The author tells of meeting an extraterrestrial prince in the middle of the Sahara desert. The prince tells the author that he lives in a very small planet the size of house where he has 3 volcanoes and a flower. Throughout the book, the prince talks about how he cares for his small planet and his special care for his flower. The prince cared and loved this flower very much but didn’t return his affections. 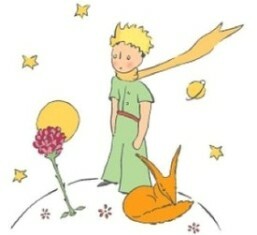 Feeling very sad, the little prince decided to leave the planet. And in his journey, he managed to visit 7 planets. The first 6 planets were very small also. He met the following in the 6 planets, a king, a conceited man, a drunkard, a businessman, a lamplighter and a geographer. The last planet he visited was the planet Earth. Here, he realized that there were so many roses and that his flower in his planet was not unique after all. And he felt that he wasn’t really a great prince. Because of that he became very sad. Now the segment of the play that I’ll be giving is in the later part of the book. It is the part that happens before the Little Prince finally leaves the Earth. It is the part where the Little Prince meets the fox. The essence of the book is contained in the famous line that was uttered by the Fox to the Little Prince. So I encourage you to listen carefully for this famous line in the segment where the Little Prince meets the Fox. FOX: "I am right here, under the apple tree." LITTLE PRINCE: "Who are you? You are very pretty to look at." FOX: "I am a fox,"
LITTLE PRINCE: "Come and play with me. I am so unhappy." FOX: "I cannot play with you. I am not tamed." LITTLE PRINCE: "Ah! Please excuse me. But what does that mean — 'tame'?" FOX: "You do not live here. What is it that you are looking for?" LITTLE PRINCE: "I am looking for the people, the men. But what does that mean — 'tame'?" FOX: "Men, they have guns, and they hunt. It is very disturbing. They also raise chickens. These are their only interests. Are you looking for chickens?" LITTLE PRINCE: "No, I am looking for friends. What does that mean — 'tame'?" FOX: "It is an act too often neglected. It means to establish ties." LITTLE PRINCE: "'To establish ties?" FOX: "Just that. To me, you are still nothing more than a little boy who is just like a hundred thousand other little boys. And I have no need of you. And you, on your part, have no need of me. To you, I am nothing more than a fox like a hundred thousand other foxes. But if you tame me, then we shall need each other. To me, you will be unique in all the world. To you, I shall be unique in all the world..."
LITTLE PRINCE: "I am beginning to understand. There is a flower... I think that she has tamed me..."
FOX: "It is possible. On the Earth one sees all sorts of things." LITTLE PRINCE: "Oh, but this is not on the Earth that I refer to!" FOX: "Oh? On another planet?" FOX: "Are there hunters on that planet?" FOX: "Ah, that is interesting! Are there chickens on that planet?" “And then look: you see the grain-fields down yonder? I do not eat bread. Wheat is of no use to me. The wheat fields have nothing to say to me. And that is sad. But you have hair that is the color of gold. Think how wonderful that will be when you have tamed me! The grain, which is also golden, will bring me back the thought of you. And I shall love to listen to the wind in the wheat..."
FOX: "Please — tame me!" he said. LITTLE PRINCE: "I want to, very much. But I have not much time. I have friends to discover, and a great many things to understand." FOX: "One only understands the things that one tames. Men have no more time to understand anything. They buy things all ready made at the shops. But there is no shop anywhere where one can buy friendship, and so men have no friends any more. If you want a friend, tame me..."
LITTLE PRINCE: "What must I do, to tame you?". FOX: "You must be very patient. First you will sit down at a little distance from me — like that — in the grass. I shall look at you out of the corner of my eye, and you will say nothing. Words are the source of misunderstandings. But you will sit a little closer to me, every day..."
"It would be better to come back at the same hour," said the fox. "If, for example, you come at four o'clock in the afternoon, then at three o'clock I shall begin to be happy. I shall feel happier and happier as the hour advances. At four o'clock, I shall already be worrying and jumping about. I shall show you how happy I am! But if you come at just any time, I shall never know at what hour my heart is to be ready to greet you... One must observe the proper rituals..."
LITTLE PRINCE: "What is a ritual?" FOX: "Those also are actions too often neglected. They are what make one day different from other days, one hour from other hours. There is a ritual, for example, among my hunters. Every Thursday they dance with the village girls. So Thursday is a wonderful day for me! I can take a walk as far as the vineyards. But if the hunters danced at just any time, every day would be like every other day, and I should never have any vacation at all." FOX: "Ah… I shall cry." 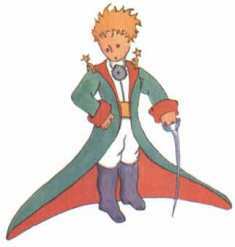 LITTLE PRINCE: "It is your own fault. I never wished you any sort of harm; but you wanted me to tame you..."
FOX: "Yes… that is so…"
LITTLE PRINCE: "But now you are going to cry!" LITTLE PRINCE: "Then it has done you no good at all!" FOX: "It has done me good. Go and look again at the roses (points to roses). You will understand now that yours is unique in all the world. Then come back to say goodbye to me, and I will make you a present of a secret." 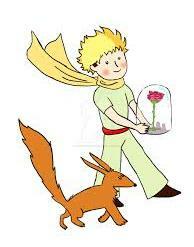 LITTLE PRINCE: "You are not at all like my rose. As yet you are nothing. No one has tamed you, and you have tamed no one. You are like my fox when I first knew him. He was only a fox like a hundred thousand other foxes. But I have made him my friend, and now he is unique in all the world." "You are beautiful, but you are empty. One could not die for you. To be sure, an ordinary passerby would think that my rose looked just like you — the rose that belongs to me." "But in herself alone she is more important than all the hundreds of you other roses: because it is she that I have watered; because it is she that I have put under the glass globe; because it is she that I have sheltered behind the screen; because it is for her that I have killed the caterpillars (except the two or three that we saved to become butterflies); because it is she that I have listened to, when she grumbled, or boasted, or ever sometimes when she said nothing. Because she is my rose." FOX: "Goodbye.And now here is my secret (pause) a very simple secret (pause.) It is only with the heart that one can see rightly. What is essential is invisible to the eye." LITTLE PRINCE: "What is essential is invisible to the eye." FOX: "It is the time you have wasted for your rose that makes your rose so important." LITTLE PRINCE: "It is the time I have wasted for my rose that makes my rose so important." FOX: "Men have forgotten this truth.But you must not forget it. You become responsible, forever, for what you have tamed. You are responsible for your rose..."
LITTLE PRINCE: "I am responsible for my rose."